I’m one of those people who has to be kept out of mischief. The possibility of not having something creative to keep my hands busy with is a situation that fills me with dread. So whenever I am going away for a weekend I frantically seek a project I can do without the need for my sewing machine. Usually this means my knitting/crochet comes out but I fancied something new this time and so started to scour Pinterest for some inspiration. Sharpie art has been around for about as long as the Sharpie itself. After its creators advertised it as the pen that will write on anything it is almost like people have gone out of their way to try to prove this wrong and along the way have invented some pretty awesome craft ideas. Whether it be on cushions, mugs, lightbulbs, phone cases, or even a manicure the world is literally drawing on whatever they can get their hands on and the results are amazing. I had a play with the Sharpie mug concept at christmas last year when I made teapots with designs on as gifts. They worked out really well and were such fun to do, I would thoroughly recommend it. So, before my trip to Devon for the bank holiday weekend I went to Newlook and purchased 3 pairs of plain white plimsole-type shoes. At less than £8 a pair, they were not exactly expensive so it wouldn’t matter so much if they didn’t work out. I already owned a large variety of coloured Sharpies so the shoes were all I needed to purchase for the project. Now, I know the next bit is the point in any project that we all hit… the blank canvas problem. The world is your lobster, there are no restrictions on what you can do, you could draw anything but now you don’t know what to draw! Sometimes I wonder what I did before Google, because that’s where I go. I type in a search term and then see what peaks my interest. I also created a Pinterest board with designs that I liked the look of so I could easily see what I had all in one place. One important note about searching Google and Pinterest for inspiration is don’t over inspire yourself. Sounds really odd right, but if you look at too many designs you end up back in the same position you started in, unable to decide what you are going to do. The first pair I decided I wanted to try were “Doodle shoes”, inspired by this tutorial. Block colour over the toes with free doodle in black over the rest of the shoe, should be simple right? I started with the coloured section at the front. You need 2 layers over block colour. Don’t get disheartened after the first layer when it looks like your classic colouring-in disaster. Give it a few minutes to dry a bit (I did 1 layer on each shoe, then went back to the first shoe as by then it had definitely dried enough for the second layer) The far left picture below shows 1 shoe with 1 layer of colour and the other shoe with 2 layers, it’s a dramatic difference and well worth investing the extra time in the 2nd layer of colour. Then grab the black pen, and doodle to your heart’s content. (I’m not kidding when I say I googled “doodle” for some inspiration on what to draw, I got into the flow of it after a while but I have never been a big doodler so I needed some help with where to start. I decided not to try to have the shoes match, the edging and style in places is similar but they are different. I would rather have something intentionally not match than something that tries to match and just doesn’t quite. I took straight to the doodling with the Sharpie, no planning in pencil first. I quite like the permanence of it, the inability to go back and change my mind. It’s the same reason I love my Polaroid camera, if you don’t have the option to re-do something you go with it, sometimes using a pencil ends up causing indecisiveness. After the success of the first pair, I was ready to try something I thought would be slightly more complicated. I loved the colour around the trim on the chevron design below but thought the swirls on the other design would be more fun. I started by selecting the colours for the trim on the shoes and then coloured this in. pay attention to the bleed when colouring up to the bit at the back to get a nice central line at the back. Make sure you lay the shoes next to each other so you colour the right parts in, I was conscious this would be an easy mistake to make. Unlike the last design I lightly drew in pencil a few of the swirls and lines onto the front of the shoe as a starting point. Like the last pair I didn’t want them to match but I didn’t want them to look unbalanced either. I then began by using the grey colour I had on the trim to create the main lines of the swirls. This is when I first realised just how much the sharpie was bleeding on the fabric. If I held the pen in one place for too long it became messy, so you want to use quick light touches to ensure only a small amount of ink transfers. You can always add more if needed, but can’t remove it once it is there. This is where I made my next mistake. I instinctively thought that Sharpie dried pretty instantly, but it makes a difference if you leave it for longer. I selected green to go with my orange and grey and began colouring in freehand between the grey lines. They instantly started to blend into each other and became messy. 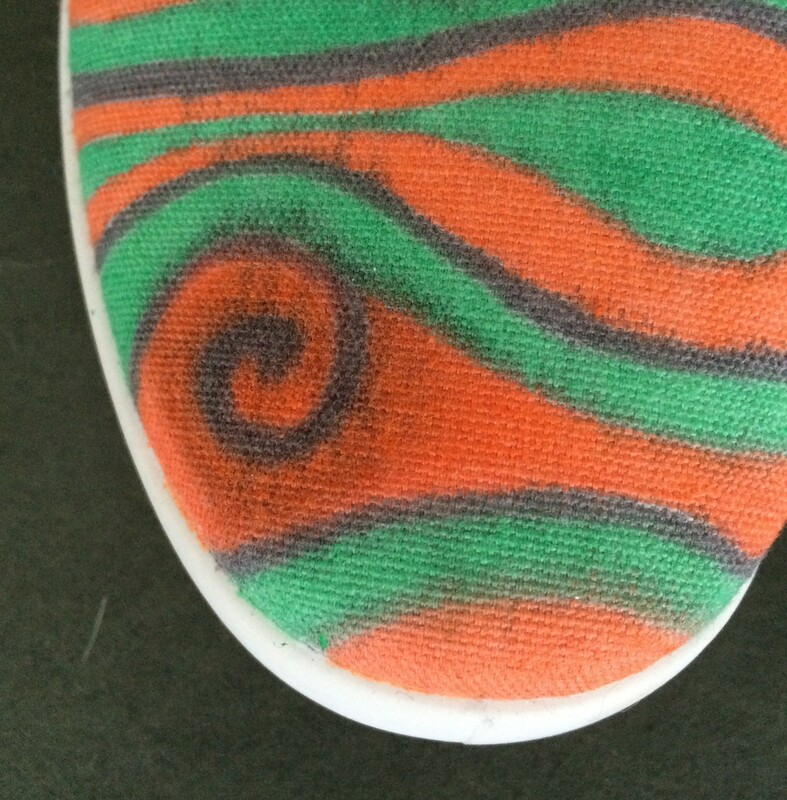 When it came to the colouring of the swirls I did 1 shoe and then the other. I should have been switching between them to give each time to dry to reduce the bleed. It did however mean that when I came to do the 2nd shoe I had learnt a lot and was able to reduce how much the colours merged by waiting between colours. Generally I’m pretty disappointed with this pair, I think hugely because they looked so awesome when just the trim was coloured. I’d quite like to get another pair to try this design again, or maybe just leave them plain with a coloured trim for a simpler look. I fell in love with the idea behind these flamingo shoes, Using just one bright colour against the white has worked really effectively and looks really simple (even though it isn’t). I decided I rather fancied a bird silhouette on my shoes rather than the flamingoes, and eventually found one that I could draw. I wanted to get a repeat design of them across the front so once the bird was the right size I used a transfer technique to get it on there. There are lots of ways of doing this but given I had limited supplies I used the way of drawing the design in pencil, and then turning it over so the pencil is against the shoe and then scribbling on the back to transfer the pencil to the shoe. It worked just well enough that I was able to see the lines to draw over them. It meant that I could easily get the same bird outline repeated across the shoes. Having selected the colour (now fully aware of the bleed risk) very lightly drew around my pencil lines with the Sharpie. I didn’t fill them in at this stage, I wanted to allow the outlines to dry before adding any more ink. So I then coloured in the trim and debated whether I wanted to risk colouring in the birds, just incase the bleed was significant. I had drawn a bird onto the outside heel of each shoe so decided I could test out colouring in the birds without ruining them should it go wrong. When I filled them in, I left a very slightly gap around the inside of the outline to allow the ink to bleed without going outside the outline. It worked really well, and is a technique I would recommend. It looked fab, so I ended up colouring in all the birds and have to say of all the 3 pairs, these are definitely my favourites! I read a lot of tutorials on creating Sharpie Shoes before embarking on this task. I knew from making the teapots that in order to stop the Sharpie coming off when it gets wet frequently there are techniques for setting them. For the teapots the advice was consistent (let dry and then bake in the oven), for the shoes everyone seems less sure! Some of the advice says, the Sharpie may fade a little but it’ll be fine as is. One I found said to put them in the tumble drier for a few minutes as the heat would help set it. Others I found said to buy a Scotchgard and spray this on them. To me, this last one made the most sense. I know that a lot of mum’s Sharpie their children’s name into their school uniform and say that eventually it washes out, so as much as I don’t tend to wash my shoes (especially because I find these types of cheap shoes don’t last well when washed in the machine often) I do want to be able to wear them without fear of them being ruined if it rains. So, for less than £6 I found that Homebase sell a Scotchgard spray that I plan to use to seal in my designs. So there you have it, a really fun and creative project that is not too expensive and super easy to do. Before you all moan that you need to be able to draw to do this, it’s just not true! Pick and design that is achievable and just go for it, what do you have to lose? It’s the kind of thing that I think would be really fun for the whole family to sit down and do together one afternoon!